Underdogs went 6-8 ATS on Sunday; three of the six won outright. We actually saw some points on Sunday, as seven of the 14 games went over. Overall, it was another pretty boring week in the NFL with eight of 14 games decided by double digits. The average margin of victory of 12.7 points was a little better than last week at least. Teams that start the year 0-2 only make the playoffs 12 percent of the time, which is bad news for fans of the Bengals, Bears, Saints, Colts, Browns, Jets, Chargers and 49ers. 2-0 doesn’t necessarily guarantee you a spot in the playoffs, as only 60 percent of 2-0 teams have made it since the new playoff format in 2002, so don’t get too excited if you are a fan of the Ravens, Panthers, Steelers, Chiefs, Broncos, Raiders or Falcons. The Patriots are now 42-7 after a loss, including a ridiculous 35-13-1 ATS (73 percent). The Pats cover was never really in doubt, as they led 20-3 after one quarter and 30-13 at the half before putting it in cruise control for a 36-20 victory. The O/U closed 55.5, but it was 57 early in the morning so I hope you played the best number if you got involved in the total. Tom Brady, who threw for three TDs in the first quarter for the first time in his career, passed Peyton Manning for the all time record of 3 TD/0 INT games with 52. The Saints’ pass defense continues to struggle, as Brady and Sam Bradford were a combined 57-71 793 yards 6 TD/0 INT against them. Their safeties have been particularly bad; Kenny Vaccaro was benched as a result yesterday. The Eagles, who lost 27-20, actually won the box score (406-344 yards and 27-16 first downs, although that was skewed some by their last garbage drive), but two costly turnovers and a few key missed tackles were the difference. This game was tied at 13 in the fourth quarter before the Chiefs extended the lead to 27-13. Carson Wentz then led the Eagles on a 75-yard drive capped by a TD pass with eight seconds left, which made over 46.5 backers and Eagles teaser backers (like myself) very pleased. Carson Wentz continues to show promise, but he is being asked to do way too much for an Eagles team that has no balance. Wentz is the Eagles’ leading rusher through two games with 61 yards. The Eagles have only called 33 runs out of 134 plays this year. LeGarrette Blount had zero carries against the Chiefs. Kareem Hunt was impressive again, and is now averaging 7.6 yards per carry with five total touchdowns; the former Toledo Rocket also became the first player in the modern era to have two 50-plus yard TDs from scrimmage in his first two career games. The Packers were killed by injuries, questionable flags and turnovers, so Falcons backers never really had to sweat despite Atlanta doing absolutely nothing in the second half. Over 54.5 bettors got an absolutely enormous fourth down conversion for a touchdown from the Packers in the fourth quarter. The Falcons, who led 31-7 one minute into the third quarter after a defensive touchdown, cruised to a 34-23 victory behind 100-yard days from Julio Jones and Devonta Freeman, who also added two touchdowns. Aaron Rodgers, who still threw for 343 yards despite losing his two starting offensive tackles and top two wide receivers, became the fastest player in NFL history to record 300 touchdowns. Your biggest blowout of the day, as this was over at the half despite the total yardage being almost identical (311-310). The Bucs led 26-0 at the half thanks to three Mike Glennon turnovers, which included a fumble, a redzone interception, and a pick six. Over backers couldn’t have been happy with how the second half played out since there were three separate drives that ended in the red zone with zero points. The Bears scored a touchdown in garbage time to cut it to 29-7, avoiding the shutout. The Bucs didn’t have to do much since they capitalized on their 4-1 turnover advantage. Glennon threw for 301 yards on 31-of-45 passes with two costly picks. Chicago only ran the ball 16 times for 20 yards. The Browns probably deserved the cover as they outgained the Ravens 386-337, but were killed by five turnovers. Over 39 and Browns +7.5 backers couldn’t have been happy with how the fourth quarter played out after the Ravens took a 24-10 lead with 15 minutes left. The Browns had first and goal the next drive, but threw a pick in the endzone. The Ravens then fumbled in Browns territory. The Browns followed that turnover with another interception in Ravens territory. The Ravens then drove into Browns territory and punted before the Browns turned it over on downs inside the Baltimore 25 to end the game. The Ravens Defense has 10 takeaways and has only allowed 10 points through two games. The Ravens wide receivers have nine total catches on the season, which is only one more catch than the defense (which has eight interceptions). Terrell Suggs continues to look five years younger. Joe Thomas played his 10,000th consecutive snap, an impressive feat for one of the best in the business. Under 41 backers were counting their money at the half as the Titans led the Jags 6-3 in an ugly one. However, the game blew up in the second half, as the Titans scored 24 straight in the first 20 minutes of the half to extend to a 30-3 lead. There were three meaningless touchdowns scored over the final seven minutes, which factored into the 37-16 final. Blake Bortles was 11-of-25 for 89 yards 0 TD/2 INT through three quarters before putting up some junk numbers in the fourth in an absolute blowout. The Titans had a very balanced attack (211 yards passing, 179 yards rushing) led by their strong offensive line, which limited "Sacksonville" to only two sacks on the day. The Redskins never trailed, but their backers had to sweat as the Rams drove the ball down 20-17 late in the fourth. The Skins eventually held them to a field goal, and then secured the 27-20 victory with a late touchdown drive in the final minutes. Over 46.5 backers were not pleased with the Rams’ defense late, as they were hoping for just a Skins field goal to keep it under. Washington, who ran the ball for an impressive 228 yards, is still struggling to find consistency at wide receiver since they lack a true No. 1. Todd Gurley looked a lot better yesterday finishing with 16 rushes for 88 yards and one TD along with three catches for 48 yards and a score (with one ridiculous leap). This was your most surprising blowout of the day, as the Broncos rolled the Boys 42-17 in Denver, moving to 2-0 for the fifth consecutive season. Denver held Ezekiel Elliot to 8 yards rushing on nine carries. The Cowboys threw the ball 50 times for 238 yards and only ran the ball 14 times for 40 yards. Dak Prescott, who did throw two interceptions including a pick six, became the first QB in NFL history with fewer than five interceptions in his first 500 passing attempts. Meanwhile, Jason Witten became the second TE to reach 12,000 yards. Aqib Talib moved to fourth all time in career pick sixes after recording his 10th, passing Deion Sanders, Aeneas Williams and Ken Houston. The Broncos had a very balanced attack on offense; C.J. Anderson ran for 118 yards on 25 carries, and Trevor Siemian threw for four touchdowns and 231 yards against a depleted Cowboys secondary. This was one of the two ugliest games of the weekend so far, so kudos if you hit the under 42. Seattle actually trailed 9-6 halfway through the fourth quarter, so 49ers bettors never had to worry about their ticket. The Seahawks’ offensive line is still an absolute mess. Carlos Hyde rushed for 125 yards on 15 carries, his second straight 100-yard rushing game in Seattle, which has only been done once in the last seven years. Brian Hoyer threw for a paltry 99 yards on 27 attempts. The other of the two ugliest games of the day. 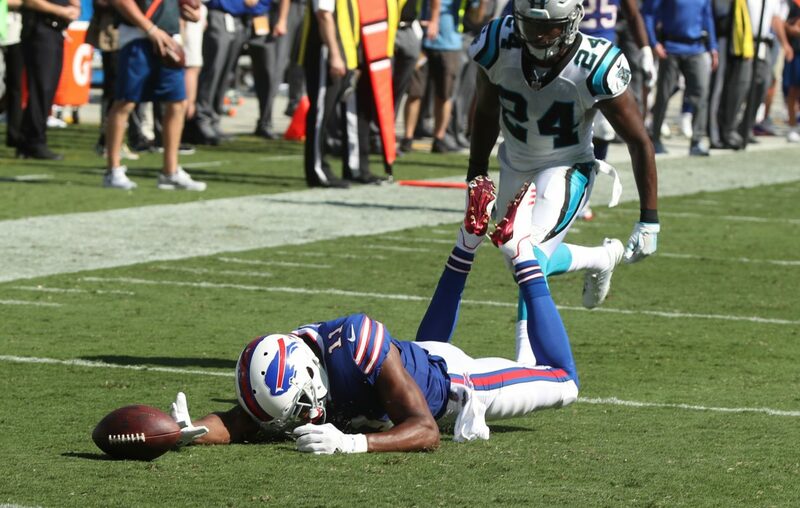 Carolina dominated the box score, as they almost doubled Buffalo up in time of possession (38:53-21:07), but the Panthers still needed a late drop by rookie Zay Jones near the pylon to hold on for a 9-3 win. The under 43 was clearly the play here. If you bet either side, you had to sweat. Bills +6.5 backers ultimately got an enormous goal line stand with three minutes to go to preserve the cover. The Panthers shut down LeSean McCoy, who only had nine yards on 12 carries. The over 43.5 hit with ease after a slow start, as did Raiders -14. The Jets’ backers felt alive when NY cut it to 14-10 with three minutes to go in the first half and then forced a punt. However, a muffed punt deep in their own territory at the end of the half flipped this game upside down. The Raiders cruised from that point forward to a 45-20 victory. Josh McCown was actually an efficient 17-25 for 166 yards with two TDs and zero picks, but the Jets just don’t have any explosiveness on offense. Explosiveness is something the Raiders do not lack. They have an abundance of talent that can take it to the house on any given play as they showed yesterday with Cordarrelle Patterson and Jalen Richard. Michael Crabtree was the star of the show, catching six balls for 80 yards and three TDs. The under 46.5 was never in doubt in the Dolphins’ 19-17 dramatic victory over LA on Sunday. However, Dolphins +3.5 backers had to work for the cover, as Miami trailed 17-13 headed into the fourth quarter. Jay Cutler had some ugly throws, but finished with a pretty good stat line of 24-of-33 for 230 yards, one TD and most importantly, zero INTs. He was helped by his safety blanket, Jarvis Landry, who had 13 catches for 78 yards. Antonio Gates caught his 112th career touchdown, passing Tony Gonzalez as the all-time TD leader at the position. The Chargers had only 44 yards rushing on 14 carries in a low-scoring game that they led for a good chunk of time. You have to feel for Younghoe Koo, who missed the game-winning field goal attempt as time expired after missing a field goal to force OT last week against the Chiefs. The Georgia Southern product also missed another field goal yesterday, and is now 1 of 4 on the year. The Chargers, who have lost two games by a combined four points, may be forced to move on from the rookie. The Colts dropped to 0-2 after a deflating 16-13 loss in OT, but Colts +7 and under 44 were never really in doubt as Indy never trailed in regulation. Those with Cards as a ML parlay or teaser piece really had to sweat as the Cardinals trailed 13-3 with 8 minutes remaining. Phil Dawson eventually won it in OT (after a bad Jacoby Brissett pick) after missing a kick to win it in regulation. Arizona outgained Indianapolis 389-266, but again had issues in the red zone. JJ Nelson had five catches for 120 yards and a touchdown; he has scored nine touchdowns in his last 10 games. This game was pretty much decided pre-kick when Sam Bradford was ruled out, which caused the line to jump to -10. Antonio Brown, who had to deal with Xavier Rhodes, had a subpar day for him with 62 yards on five catches, but Martavis Bryant picked up the slack with three catches for 91 yards and a touchdown. Le’Veon Bell looked a little off again after totaling only 91 yards on 31 total touches. The Steelers are banged up on the offensive line, but Bell’s production shouldn’t be this meek.